Telling the application to quit. Hiding and showing the mouse cursor. Changing window attributes such as the title, frame, and compositing level. Hiding and showing the published input parameters panel. In OS X 10.5, you can select the template composition by going to File > New From Template and choosing QuartzBuilder Application. In OS X 10.6 and 10.7, you can create a copy of the template composition on your desktop by going to QuartzBuilder > Install QuartzBuilder Template. The template composition is a Stationery Pad, so when you double-click the template composition it will open a new copy of the template composition. Using the composition keys, you can set properties of the built application. To add properties, go to Editor > Edit Information. net.kineme.qb.autosaveName Sets a key for saving window size and position in the application's preferences plist and restored the next time the application is opened. If it's empty, window size and position won't be saved. net.kineme.qb.parameters 0 means never show the published inputs panel. 1 means show it as a panel. 2 means show it as a HUD. net.kineme.qb.pauseWhenUnfocused If true, the built application will pause rendering when its window is in the background. net.kineme.qb.saveInputParameters If true, the values of published input parameters will be saved in the application's preferences plist and restored the next time the application is opened. net.kineme.qb.aspectRatio The aspect ratio of the application's window (ratio of width to height). For example, the value 1.333 locks the window to a 4:3 aspect ratio. More properties are available. See the template composition. Some Quartz Composer plugins support only 32-bit mode, some support only 64-bit mode, and some support both. 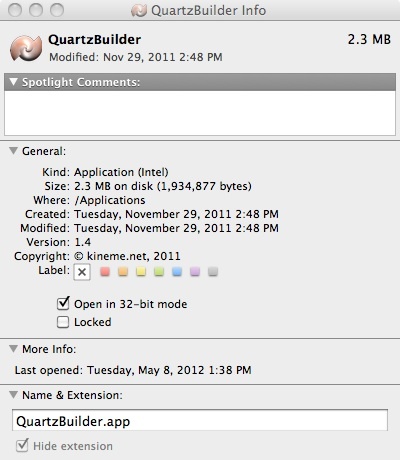 To build an application that contains 32-bit-only plugins, you must run QuartzBuilder in 32-bit mode. You can select this mode by highlighting the app icon, and entering Command+I on your keyboard. If a plugin doesn't show up in Resources, check Console for warnings about incompatible architectures. The plugin may be 32-bit-only and QuartzBuilder is running in 64-bit mode, or vice versa. QuartzBuilder provides an option to select the architecture of the built application (32-bit/64-bit universal, 64-bit-only, or 32-bit-only). To select the 32-bit-only architecture, you do not need to run QuartzBuilder in 32-bit mode, as long as all your plugins are 32-bit/64-bit universal. QuartzBuilder does not ensure that AlphaBlend.plugin will be loaded into your application if your composition uses it. Please manually add it to your resources if you are using it. QuartzBuilder doesn't handle FreeFrame based plugin resources. Insure that these are loaded on the system the app is deployed on manually. QuartzBuilder doesn't add or load ImageUnits from it's resources. Insure that these are loaded on the system the app is deployed on manually. If one has built an app that uses the save parameters feature and manipulates the parameters, and subsequently builds the app again without the save parameters feature, they will find that their compiled app loads the default settings left behind by the earlier build. One can delete the app cache from the User Library to get rid of this behavior. The compiled app will restore as expected on other installations; it's simply loading the parameters from your earlier build, and this behavior will be particular to the system the app was compiled and run on.